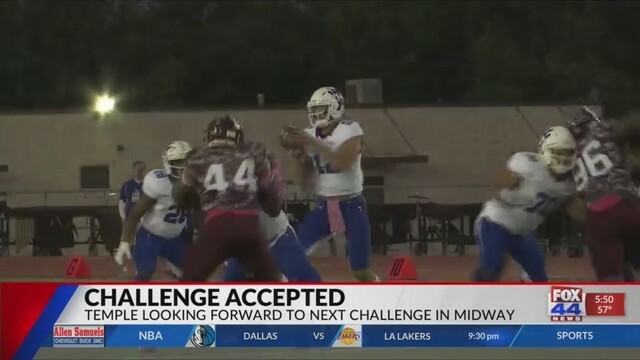 Temple, TX - The District 12-6A Championship will go through Temple on Friday night as the defending district champion, Midway Panthers, will visit their new 6A challengers in the Temple Wildcats. Temple has rolled through their first trip around district 12-6A with, possibly, their toughest test to come on Friday. Temple Head Coach, Scott Stewart, knew his team could compete against quality 6A programs, he just wanted to see them do it for a full season, and that's what they have done so far this season. "I think it just means we can compete at any level," Stewart said. "We've played some really really quality 6A opponents even when we were in 5A. What I wanted to see was can we withstand the brutality and the rigors of a 6A Schedule so, yeah I've been pretty proud of how they handled it." Quarterback Jared Wiley has guided this team through their first season in 6A, and knew that this team had the capability to beat anyone they play. "We always knew we were talented," he said. "We know we got slept on, in the preseason. Lat year in the offseason people knew we were going to lose a lot, but our guys especially the o-line, they've done really good, stepping up, making big plays in big situations." The Wildcats know with Midway coming to town they are going to get their best shot, but they wouldn't expect anything less in what amounts to a district championship game. "It's going to be a playoff type atmosphere," Senior Markel Reed said. "Both teams are undefeated in the district so we just plan on doing our job, coming out being physical and competing being physical and fast." There are still two weeks left in the season, but Wiley knows this game will be one that determines who wins the 12-6A crown. "Competition is always high for us anyway, but for a team like Midway to come in here and try to take a district championship from us, It's definitely going to be real competitive," he said. The Wildcats and Panthers kick off at 7:30pm on Friday night at Wildcat Stadium.